The black E-690 PL Elements Cover from Manfrotto provides total rain and dust protection for your small, compact DSLR or mirrorless camera. The tough TPU (thermoplastic polyurethane) material easily covers your rig and protects it from harsh weather. Also, dual zippers provide rapid deployment and removal of the cover. The cover also has a handy clear window through which you can see all camera/lens controls. 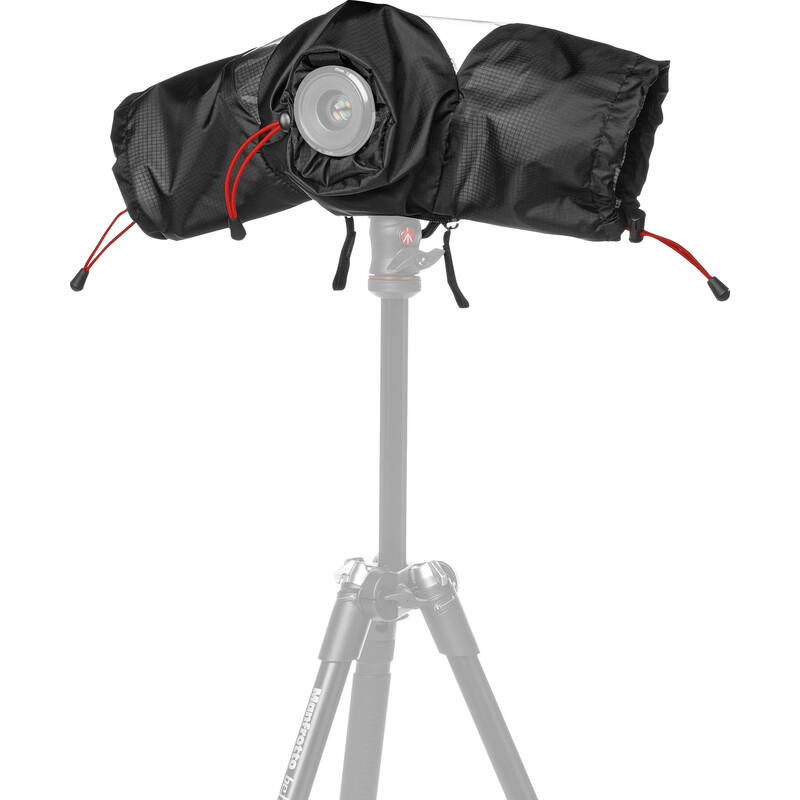 Dual sleeves make it easy to use whether hand-held or mounted on your tripod. The cover is adjustable and features a stiff hood that can be manipulated to fit around your lens. Box Dimensions (LxWxH) 10.551 x 6.85 x 1.575"
E-690 Pro-Light Elements Cover is rated 3.0 out of 5 by 2. Rated 5 out of 5 by bkphoto from Can use w/ the 5D Mark III + short lens too! We love all of the Manfrotto products we own, and this rain cover is no exception. It is well made and easy to use. We have the larger version of this rain cover for full frame DSLR's and while it it nice for the 5DM3 + 70-200 combo, but when using primes there was so much excess material. I ordered this even thought it said it was for small/mirrorless in hopes that it would work when I using lenses such as the 50 1.2. I can use this cover with the 5DM3 body and the following lenses: 50 1.2, 85 1.2 and even the 24-70 2.8 II when locked at 24mm. If you've tried the full frame DSLR version and thought it felt a bit oversized, this could be a good option for you. Rated 1 out of 5 by Sue from Did not work for me My camera is small and this cover did not work for me. It is intended for a long lens.